Clean the garlic bulb and remove as much of the skin as possible leaving at least 1 layer around the bulb. Place in the middle of a piece of aluminum foil and pour one tablespoon of olive oil onto the garlic. Seal the foil around the garlic and once the garlic is completely covered, leave in the oven for 30 minutes. Wash and strain the kale. Remove the garlic from the oven and let sit for 10 minutes or until you can handle it with your hands. Remove the layer of skin and put the cloves in an oven friendly container. Chop the kale leaves into small pieces. Using a food processer, mash the garbanzos with 3 tablespoons of the liquid they came in to make a puree. Add the kale, garbanzo paste, parmesan cheese, pepper, salt, ground chile ancho and a tablespoon of olive oil and mix until everything is combined evenly. Cover the container with aluminum foil and bake for 10 minutes or until the cheese melts. While it bakes, you can fry the bacon and cut it into strips. Pour the dip into the container you will serve with and sprinkle the bacon on top. Serve with slices of French bread, crackers or pita. This dip tastes best when it's warm. If it gets too cold, just microwave for a bit. You can mash the garbanzos in advance to save on time; just refrigerate in a vacuum-sealed container. Garlic is an amazing product. It's easy to find, cheap and gives food a delicious flavor. It's also quite versatile, as it can be roasted, baked, boiled or eaten raw. I find the combination of garlic and parmesan cheese to be irresistible and that was the first thought I had when I began planning this dip, at the same time I wanted to find the right green to add to balance out the flavor. 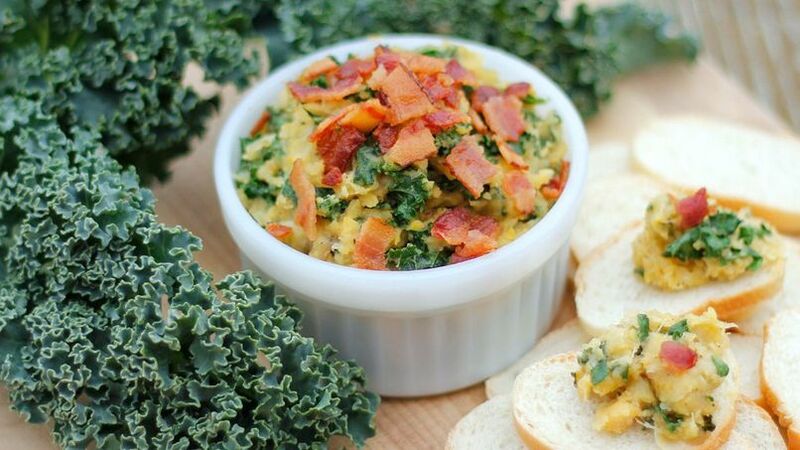 Kale is the perfect addition to this with its light taste and crunchy texture. This time I chose to prepare a light dip without mayo or cream by using garbanzo paste instead, giving this dip a creamy, delicious flavor. "The only problem with this dip is that you won't be able to stop eating it." These were my husband's words as he served himself another piece of bread. I must admit, I agree with him!